Set at the point where the Eastern Pyrenees plunge into the Mediterranean Sea and bathed in the warm Mediterranean sun, Les Pins promises to be your best camping holiday yet. This luxury camping site is located at the historic Catalan seaside resort of Argelès-sur-Mer. You will appreciate the wooded seclusion of a LuxCamp mobile home and the direct access to sandy beaches. As for the kids, Les Pins welcomes children with nonstop fun activities. 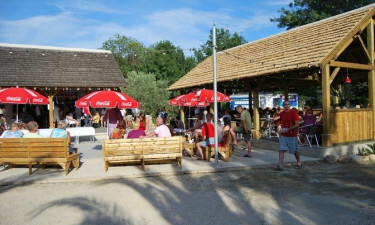 Les Pins is a specialist in camping luxury. The family-friendly atmosphere encourages children to take full advantage of the aquatic park, organized activities, and playgrounds. Meanwhile, parents can laze on a deckchair in the spacious solarium and enjoy the view of the splendid Pyrenees. Les Pins sports a heated swimming pool with a separate paddling pool for youngsters, a Jacuzzi, and an expansive solarium. The more adventurous will want to race down the 3 side-by-side toboggan slides, and organized activities include aqua biking and aqua aerobics. 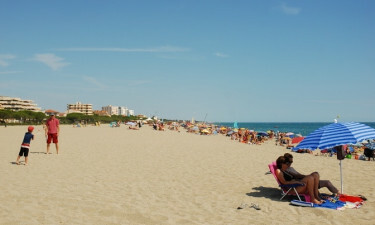 A short 300 metre walk from Les Pins brings you to the star of your camping holiday — 7 km of golden sand. The sandy stretch invites you to take a stroll, enjoy the sea breeze, or engage in a brisk volley ball game. Water lovers can experience the sparkling Mediterranean by canoe or sailboat.